Balvenie Castle is an impressive fortress that was fighting in the lands of Scotland, which is abound with impressive fortifications. Today, Balvenie has only sketchy remnants and ruins of the impressive structure that was built in the Middle Ages in this eastern part of the British side. Balvenie Castle is located in Glen Fiddich close to Dufftown, which is located in the Scottish region of Moray. The original fort site of today's Balvenie Castle was raised somewhere in the 12th century and was then known as Mortlach. For over 500 years this palace served as the family stronghold of the most powerful rulers who ruled this part of northeastern Scotland, they were the Comyn clan also known for their fearsome nickname - Black Comyns. They were Counts of the Buchan. In the second half of the 13th century Black Comyns turn Balvenie Castle into an impressive and respectable fortress. In the early 14th century the castle fell into the possession of the Counts, Douglas, where the chimneys were defeated by Robert the Bruce. Around 1455 the counts of Douglas fell into disgrace because they were crushed by King James II. The King in turn gave the Balvenie Castle to John Stewart, who was the Earl of Atholl. Over the next 250 years Balvenie Castle was a family possession of the family of Stewart. His wife was called Margaret and before becoming the wife of the Earl, she became a widow of the eighth Earl of Douglas, and then obtained a divorce from the ninth Earl of the same clan. For the duration of their residence in Balvenie, Stewart was doing everything in his power to turn the citadel of the cool dark medieval castle into a pleasant and comfortable livable Renaissance palace. 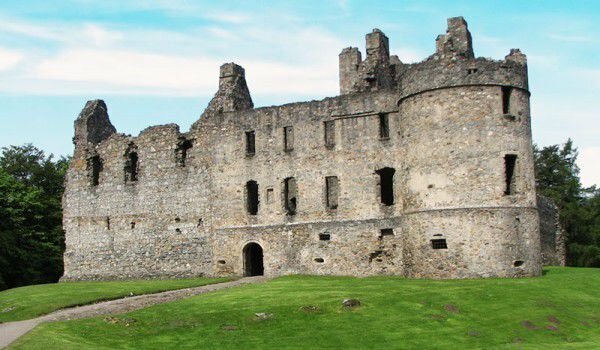 Balvenie is a fortified castle, with wide walls and watchtowers. Stewart added comfortable living areas and bedrooms. After 1755 Balvenie was completely abandoned and began to become broken as it was repeatedly plundered and demolition was used for various purposes. Today the Balvenie Castle is owned by the Scottish government, and is open for visitors during the summer months. Near the castle is the distillery of William Grant & Sons, which produce the famous Scotch whiskey Balvenie.